Transportation Costs > How Much Does a Towing Service Cost? 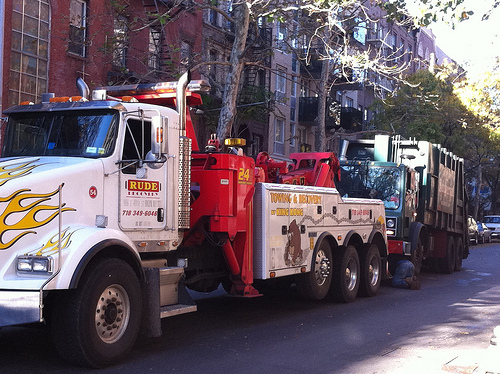 How Much Does a Towing Service Cost? Every year, millions of cars are towed for many reasons, and in your lifetime, there’s a good chance you will need to be towed at least once. The cost of a tow will depend on your circumstances, where you live, how far your car needs to be towed, the type of car being towed and the towing company you choose. Based on these factors, the prices can be anywhere from as little as $30 to more than $650. A standard tow will always be cheaper than hiring a flatbed tow truck, but if your car were in a car accident, this will often be your most expensive scenario. Regardless of how far you have to be towed, a towing company, even if you had to go a mile, will always have a minimum rate, referred to as a hookup fee, which is usually about $30 to $60 on average. Aside from the hookup fee, a towing company, depending on the billing policy, will then charge another $3 to $7 per mile. Refer to our table below to see what you could pay for a tow. AAA, if you were a member of the club, offers three membership tiers, and the costs will depend on which tier you belong to. A basic member will only receive a short-distance tow, while a Plus member can receive a tow of up to 100 miles. Premier members will get up to 200 miles of free towing. Again, to get these perks, you need to be an AAA member, and the costs of these plans can range anywhere from $50 to more than $130. Pep Boys offers a towing service for $24.99 for the first 10 miles, but this price is for new and existing members. If you were not a member of the club, then the regular price is $49.99 for the first 10 miles. This service is only available to those who are located near a Pep Boys store. Some companies may charge a premium when rendering services on nights and during weekends or holidays. Aside from towing a vehicle to a designation of your choice, a tow company can also help deliver gas, jump start your car, unlock doors, change your tires and/or pull you out if you were stuck. If you were to need any of these services, additional fees could apply. Most of these services will be about $75. Depending on how the towing company bills, they may tack on sales tax and/or a fuel surcharge. Mentioned above, the circumstances could affect the price. For instance, if your car were stuck in the mud, the tow truck would have to “winch” your car out, which could increase the amount of time the tow truck driver has to be at the site. This, effectively, could increase the costs, usually around $75 to $100 per hour. Some towing companies allow you to keep your car on its lot for a storage fee, which can cost anywhere from $30 to $75 per day/night. Ask a trusted mechanic for recommendations if you don’t know which towing company you should use. Many car insurance companies offer towing plans and it may be included in your policy. Talk with your insurance company before hiring a tow company to see if you’re covered. Almost all towing companies will be transparent with their pricing. Before you have a car towed away, call a few companies before deciding to see what each company will charge. If you have roadside assistance, check with your carrier before hiring a tow company as you may need to use their authorized company in order to have your bill covered. In most cases, carriers will have a limit, usually $50 to $150 of coverage, and there could be a mileage limit on top of this as well. Since all carriers are different, talk with your company before you call a tow truck company to understand your policy. If you were in an accident and your car is considered a total loss, then your car insurance policy should cover the cost of the tow during the claim, even if you don’t have a roadside assistance policy. Check your car’s warranty. If it’s still under warranty, the automaker may cover the towing if it were due to a defect. Some credit card companies offer free roadside assistance. Check with your credit card company to see if you’re covered.